I decided to try a new bread recipe this week, so I searched this book for a sandwich bread recipe. I’ve never made a no knead bread dough in a loaf pan before, I’ve only made free form round crusty loaves. My usual sandwich bread recipe calls for butter and sugar – both of which are not in this recipe. I’m hoping the flavor isn’t laking and that it is worth trying out. 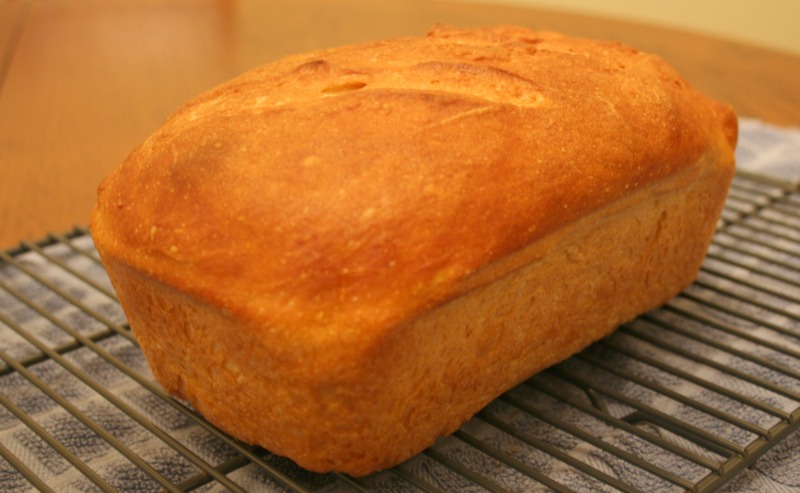 This recipe makes 4 pounds of dough which is enough for two 8×4 loaves. All ingredients and mixing, storing and baking directions can be found at this website. It’s too much to even copy and paste. However, those instructions are for a free form loaf, not one baked in a loaf pan. Instead of shaping the dough and placing it on the pizza peel, shape it into an elongated oval and place it in a lightly oiled loaf pan. Follow the rising and “Baking Day” directions as written, but leave the loaf in the oven for 40 to 45 minutes. There seems to be way too many steps for this to be a simpler method of bread making, but once you get the hang of the technique it couldn’t be easier. Here’s hoping this a tasty bread recipe! Thanks for reading, enjoy!